On Nov. 19, Gov. Tom Corbett ceremonially signed legislation to eliminate fraud in the Low Income Home Energy Assistance Program (LIHEAP) and Weatherization Assistance Program. Rep. Bryan Cutler (R-Peach Bottom) has been the prime sponsor of the proposal for the past three terms. 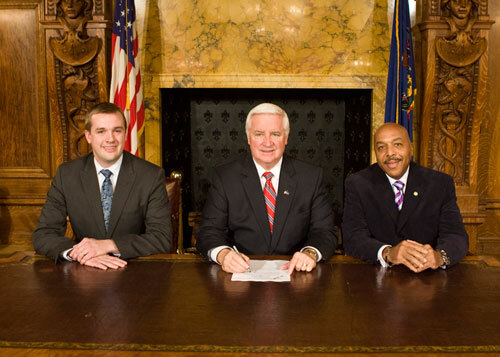 Pictured (from left) are Cutler, Corbett and Rep. Ron Waters (D-Delaware/Philadelphia). HARRISBURG – Gov. Tom Corbett Monday ceremonially signed legislation authored by Rep. Bryan Cutler (R-Peach Bottom) to reduce fraud, duplication and abuse in the Low Income Home Energy Assistance Program (LIHEAP) and Weatherization Assistance Program. Cutler thanked Rep. Ron Waters (D-Delaware/Philadelphia), who is co-author of the legislation, along with Corbett and Auditor General Jack Wagner. He noted that the law was only possible with bi-partisan support, and assistance from Wagner and the Corbett administration. Act 164 will implement fraud detection and prevention mechanisms through the use of an Income Eligibility Verification System and will strengthen fraud reporting measures and whistleblower protections. The law also requires periodic performance audits by the Pennsylvania Department of Auditor General. Cutler, a leader on welfare reform, has advocated this legislation since his first term in office.